Jumper is now free and can be dowloaded from our site in the download section (Fanan team demo pack). Jumper is a new concept that allows live performers to play with up to 16 VSTi instruments on stage or in live jams. By using your keyboard’s midi cc buttons, you can instantly switch between instrumets that opened in your favorite DAW and you can even split your keyboard into 2 zones and route instruments to keyboard’s upper and lower zones. Jumper is a VSTi plug-in for windows computers. Each instrument button is routing the MIDI signal to the matching VSTi instrument in the DAW through a matching MIDI channel (from 1 to 16). 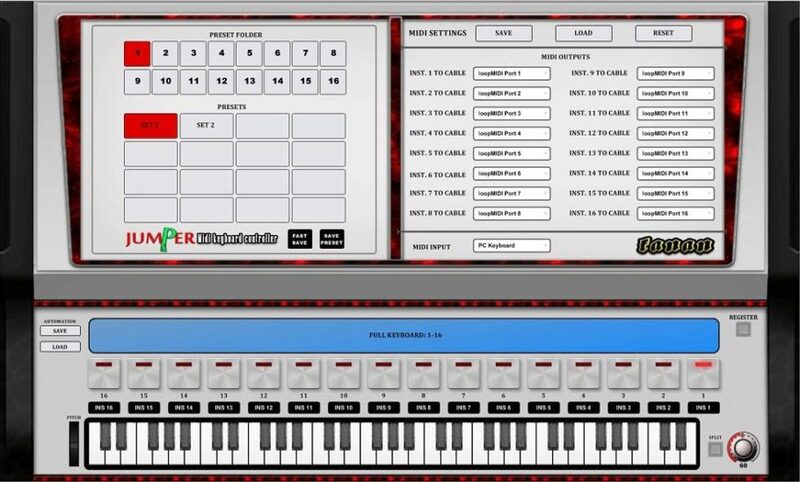 All you have to do is to connect your midi keyboard to Jumper and set your VST instruments in your DAW to recieve midi signal from Jumper’s midi channel.